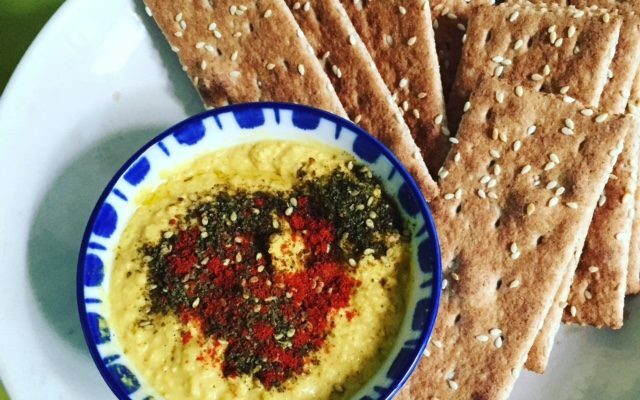 I serve this hummus all year long as an appetizer with crackers, crudités or toasted bread. It can be used as a side for any type of Middle Eastern entree such as kebobs or a spread on a sandwich. Sometimes I add scallions or cilantro sometimes I add lime instead of lemon. This is a creative bean dip that can be made with black or white beans, garnished with chopped olives or toasted pine nuts. Make this recipe your own and enjoy. Puree the chick peas in a food processor with the lemon, tahini, garlic, soy sauce, turmeric and pepper. Taste and adjust seasoning. Transfer the hummus to a medium bowl and sprinkle with the parsley or cilantro and drizzle with a small amount of olive oil. This recipe can be made ahead and refrigerated for up to 5 days. Place the pita triangles onto two baking sheets. Toast in the oven until golden about 8 minutes. Transfer the triangles to a serving platter, place the hummus in the middle and serve. The pita triangles can be made ahead and stored in a storage bag for up to one week. They can also be frozen.